When the Chapel Hill-Carrboro Chamber of Commerce (CHCCC) decided to undertake a major rebranding initiative in 2018, updating its name, tagline and logo mark, Rivers Agency was a natural choice to help with the project. After all, as a long-time member of the CHCCC, Rivers Agency had the unique mix of technical expertise, market familiarity and creative passion needed to make this important project a success. Since its previous brown square logo was created more than a decade ago, CHCCC has substantially expanded its geographic footprint and evolved the services it offers to the local business community. To gain insights into the best way to position itself for the future, the CHCCC’s Board of Directors worked with Rivers Agency to undertake an extensive brand discovery process. The process included more than a year of board retreats, membership surveys and discussions with key stakeholders. 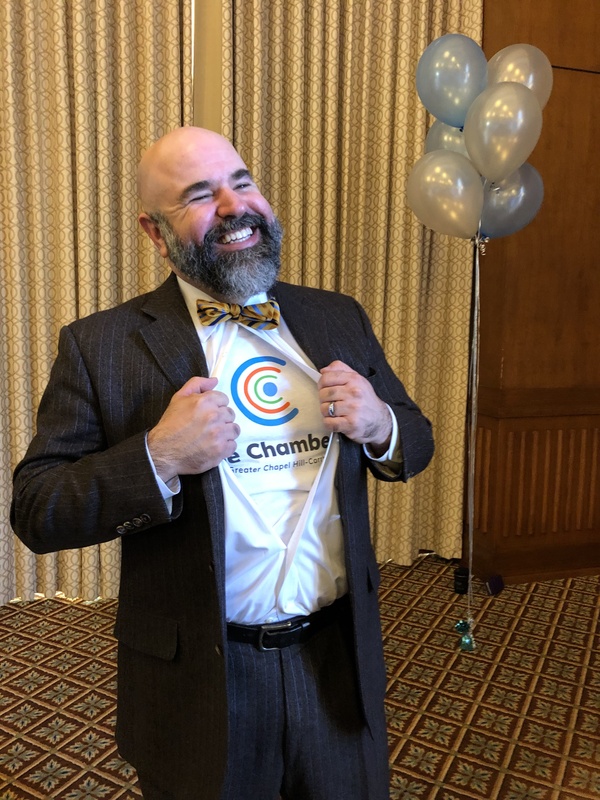 After an interactive workshop in October, The Chamber’s board agreed it was time for a rebranding — one that would better capture the group’s current identity and resonate with the broad range of businesses and communities it serves in the region. A new name — The Chamber — was adopted, along with a new tagline — For a Greater Chapel Hill-Carrboro. In addition, Rivers Agency created a new logo mark for the organization with an updated, more contemporary feel. The logo features a blue circle in the center, representing Chapel Hill, encircled by a series of “C” shapes representing Carrboro and Orange and Chatham counties, each with their legacy colors. The new logo and brand identity were unveiled at The Chamber’s annual meeting on Feb. 1. For flexibility, three versions of the logo were created, complemented by an updated color palette and a new minimalist font that works well in both print and online formats. To ensure the new brand is applied consistently, easy-to-use brand guidelines were developed and are available to The Chamber’s partners. Rivers Agency is updating marketing collateral with The Chamber’s new brand, including social media properties, email and ad templates, letterhead and business cards. These new assets provide The Chamber team with the foundation to carry the brand forward and implement it more broadly. We are honored to be a part of this massive branding process.